What angle does this book give on PowerCLI? The book covers where to get PowerCLI and its history, including version differences and their change logs. Developing single line scripts into longer ones, reusable code and how to document your scripting. Bridging scripts that pull key components of VMware scripting and incorporating Windows based calls in the same script, an introduction to vRealize Orchestrator and PowerShell Workflows and lastly incorporating PowerShell into other VMware products. Who should buy this book, beginners, experts or all? As this is an essentials book, the intended audience is the beginners to intermediate skill set, although I hope some points will be useful to even the most seasoned PowerShell scripter. This being said the ideal reader will be the VMware Administrator or the Windows Administrator that works with VMware products on a daily basis. Chris Halverson is an Americas based Professional Services Senior consultant, which focuses on the Software defined datacenter. Crossing several product boundaries (vSphere, SRM, vRO, vROps, and others) he helps customer’s design, build and administer their environments; and uses PowerCLI as one of the ideal tools for the job. Before VMware, he had served the community as a VMUG leader and worked for end clients as a Technical Architect and infrastructure architect. All in all he has worked as an IT generalist, Server Administrator for close to 17 years. Starting with VMware technologies in 2006, he discovered this “virtualization” journey with a project implementing GSX at a customer site. Adapting Batch, and VBScript scripting into Microsoft’s new scripting language scripts, he attempted to build a bigger repository of knowledge in this realm over the past 5 years. 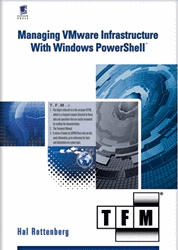 With other PowerCLI books on the market what sets this one apart? I look at PowerCLI as an extension of what one must do in the administrative arena. Developing a one line script here and there does provide a key differentiator in pulling information or bridging automation into a daily task list but anyone can look up a script to do an X task, Y way but truly understanding how PowerCLI and PowerShell works takes time. This book looks at two different modes of script development; one is through the looking glass of building a DevOps practice and two combining VMware administration with Windows administration. With my background as an architect I didn’t want to see another book that starts with “Hello World” and ends with an elaborate script that can’t be built upon. I wanted to write something that builds concepts, theory and a confidence to write a plan, a schedule and to think before scripting. The other viewpoint is that I didn’t train as a programmer and view scripting as an extension of an administrator’s job. This knowledge was developed through the school of hard knocks and takes the idea that some of the pain I had to learn and shorten the time frame for the reader. What script are you the most proud of? I have over the years created a number of scripts to help with my daily job, pulling informational reports and collecting a complicated set of components from a large set of VMs. Sometimes, I may devote too much time to developing a script but always think through repeatability. My favorite script is likely a VM build script that myself a couple others in my group at the time developed. Looking back, it took a long time to write, troubleshoot and debug where some figured it might be a calculation of diminishing returns but at the end of it, it increased the productivity and the increased knowledge for the group by a significant margin. Although the special kudos on twitter I got from Alan Renouf for my attendance tracking script at our local VMUG was pretty special too! Why, in your opinion should people use PowerCLI? Even now I work with PowerCLI as much as possible, but building proficiency with a technology that increase productivity by such a huge degree is worth the investment in learning. Imagine going through 5000 VMs looking for a setting, to see if it is checked or not. Taking 15 to 20 minutes understanding how to find it on a single VM, and then placing it in a simple loop to report on the list in less than 5 minutes is worth it in my mind. PowerCLI provides that type of power. The PowerCLI team has expanded and grown the product into a mature and well-used module within the PowerShell family. This entry was posted in Book and tagged PowerCLI on May 2, 2016 by Alan Renouf. Thanks for sharing the details of this book .I will definitely buy this book. This book is very good to know more about the PowerCLI. This is awesome that the book covers where to get PowerCLI and its history, including version differences and their change logs. Developing single line scripts into longer ones, reusable code and how to document our script.